The difference between “Shares” and “Stock” has been almost disappeared. Generally these two words are used to the two pieces of papers which claim the ownership in the. “Stock" is a term used to describe the ownership certificates of any company, where as “Shares" refers to the ownership certificates of a particular company. Factually, stocks and shares are same thing. The minor difference, now-a-days, between stock and share is overlooked. It has more to do with syntax rather than financial or legal. 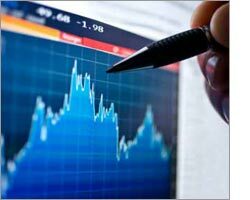 As trading stock and shares is most lucrative method of making money, many of us would like to invest in stock market. It is very interesting to invest in shares and stocks, though most of the people would like to start with small money. Before you start investing in share and stock, you should learn basic of online trading. Whether it is Bombay Stock Exchange (BSE), National Stock Exchange (NSE), London Stock Exchange (LSE) or New York Stock Exchange (NYSE), trading terms are more or less similar. A click of a mouse, sometimes, draws a line between making money in stock market and losing one. Trading shares and stock online is quite interesting as well as tricky. You have to be very careful. You need to know about the Stock Market, an then about shares and mode of trading. Stock Market is a place where the shares of listed companies are bought and sold. In India, you have BSE and NSE as two big stock exchanges. Shares and Stocks are bought and sold by you and me only through approved brokers. Approved brokers are mostly banks like the ICICI, HDFC, IDBI, UTI Bank, SHCI, are to name a few. For online share trading, Demat Bank Account is required. Go to the respective bank and open a Savings account and ask them to open a Demat account. A Demat account is nothing, but the account where the shares bought by you will be kept separately.Only you could operate that account online, through Internet. You could open the online facility offered by the ICICI, HDFC or Share Khan or others and buy shares you wish and decide the quantity and the price. Here the bank will act as a broker. You online order for purchase would be carried out by the bank. They charge broker commission, much less compared to private brokers. It is very important for you to have enough balance to your credit in your savings account. As and when you buy or sell shares and stocks online, your Demat account will be accordingly affected. Depending on the amount of profit earned, tax will also be deducted by the bank (TDS). The bank will give you a TDS Certificate by the year end, i.e., March 31, of that year which you could attach with the return to justify the tax payment. Always sell the shares when the price is up and buy the shares when the price is down. Everybody had to adapt to this formula. Whenever you want to buy, look for 52 week low, look for the peer companies, their price and compare it with the company you want to buy.Look for the prospectus, future plans and the profit the company ought to make in the next year. Take the perception or a change and buy. When you order to buy or sell at market price, then the price gets executed at the current rate in the market. In the market there is no need to mention the price, if you want to sell or buy at current price. Limit Order is exactly opposite to Market Order. If you wish to sell or buy shares at any specific price, then you have to mention the price limit and as and when market reaches that price, your shares will be sold and bought. But sometimes, it happens, the price doesn’t reach to your limit order. In a day trading it’s risky, as you have to close all your transactions before the trading stops for the day. And if the price doesn’t reach to the limit order, your order will be opened and you will have to bear heavy loss and pay the penalty. Stop Loss and Trigger Price can decrease your losses. This is very necessary especially if you are doing Intra Day Trading.You can use pivot calculator for Stop Loss Calculation for delivery based trading and Intra Day Stop Loss depends on how much you are ready to lose. It also depends on movement of the scrip during particular day. Khar (West) - Mumbai - 400 0052 India.